Oliver Stanley Gibson, the youngest of seven children, was born in Frosterley in 1897. At first he combined his farming interests with managing the accounts at the Rogerley Quarry owned by Pease and Partners. By 1921 he was the proud owner of a Ford car and he started a taxi business; three years later Oliver had visions of carrying more passengers and he obtained an eight seater Dodge bus to ply along the road between Stanhope and Crook. Another Dodge and a Studebaker soon followed and the small fleet was housed in a garage at Cragg Cottages at the side of the main road in Frosterley. By 1929 Oliver, trading as Weardale Motor Services, had three employees besides sister Isobella who was a conductress. In these early days several other small proprietors competed with Oliver for passengers over the same route. Jossie Dowson of Frosterley who traded under the name of 'Safety Coach Service' operated a small Ford and two Chevrolets from a garage at 'The Sands'. One of his conductors was remembered for not having a cash bag and putting the fares into his own pocket. Dobson Baldwin and Thomas Barlow were Motor Engineers at near by Tow Law. From 1926 they entered the scene as bus proprietors trading under the name of 'Heather Bell Services'. They operated two routes from Stanhope to Crook and Bishop Auckland respectively which diverged at Harperley. Thomas Cook was originally a haulage contractor at Consett who by mid 1929 had started a bus service from his home town via Tow Law and Wolsingham to Stanhope. The Road Traffic Act of 1930 was aimed at cutting out wasteful competition as well as improving the standards of the remaining operators. The Traffic Commissioners decreed that the Stanhope-Crook route was to be shared between Oliver Gibson, Dowson and Baldwin and Barlow on a 50%, 25%, 25% basis. The basic timetable required the operation of only two buses. 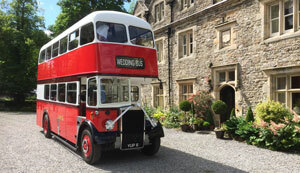 Gibson provided one bus for all day operation whereas Dowson operated on the early shift one week followed by the late shift the following week. Baldwin and Barlow always operated on the opposite shift to Dowson. On Saturday afternoons an enhanced frequency required one bus from each operator which deprived Gibson of some of his allotted mileage. Passengers using the last services at night needed to be aware of the identity of the operator. The last departure from Stanhope was scheduled to terminate at Wolsingham but if operated by Dowson or Gibson it would run no further than its Frosterley garage. Likewise the last departure from Crook was scheduled to terminate at Frosterley but in actual fact if operated by Baldwin and Barlow it would turn round at Wolsingham. The first excursion licences were granted to Oliver Gibson in time for the 1932 season. A maximum of three vehicles could be operated on any one day. It is not clear whether any coaches were actually in the fleet at this time but as the distances covered were fairly short the passengers were probably quite content to travel on buses. Thomas Cook ceased operating his service from Consett in June 1939 and the Traffic Commissioners decreed that the portion of route between Tow Law and Stanhope should be jointly operated by Gibson and Baldwin and Barlow. 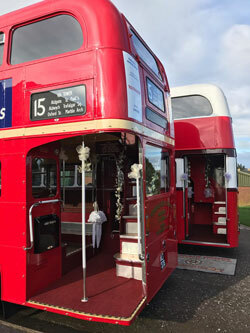 During WW2 fuel rationing caused a 25% reduction in the mileage operated and one old Leyland Lion bus was requisitioned by the War Department never to be returned. Towards the end of the war two utility Bedford OWBs joined the fleet with their Spartan bodies lacking many of the normal refinements. 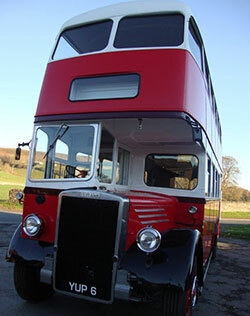 Increased passenger numbers resulted in the purchasing of the first double-decker for the fleet in 1949. Tree branches had to be lopped along the route and as the low bridge body had a sunken upstairs gangway on the right hand side lower deck passengers on leaving their seats had to take care to avoid banging their heads. In the early days bus services up the dale from Stanhope to Cowshill and Rookhope had been provided by the local entrepeneurs Arnold Corbett, Thomas William Forrest and Joseph Stockdale. Possibly as a result of the Road Traffic Act Corbett sold out to Forrest in 1930. Soon after this both Forrest and Stockdale sold their businesses to Oswald Huntly who was an influential businessman from Bishop Auckland. Huntly owned the 'Motor Supplies' garage and motor agency at Cabin Gate. A new Company,'Stanhope Motor Services Ltd.' was registered in 1933 with garage premises at Shittlehope Burn Stanhope and Jack Patrick as Chief Engineer. By late 1955 the share capital of Stanhope Motor Services was purchased by Oliver Gibson and as part of the deal Jack Patrick became the Chief Engineer of the combined undertakings. For licensing (and possible taxation) reasons Weardale maintained the Stanhope Company as an operational subsidiary until the early 1990s. The former Stanhope fleet of seven vehicles was quickly repainted in the Weardale colours of red, maroon and white but with the SMS fleet names reapplied. The combined fleet strength was 16 vehicles. Weardale Motor Services was registered as a Limited Company in late 1961 prior to making two important purchases which gave it complete control of the stage carriage services in Weardale. 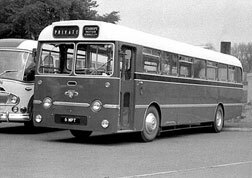 The acquisition of Dowson's business in February 1962 included four vehicles whereas the purchase of the Baldwin and Barlow business of the same date did not include any vehicles. Oliver Gibson died in June 1963 and control of the Company passed to his two sons Maurice and Roland and his widow Beatrice. Deregulation as a result of the 1985 Transport Act caused changes in the operation of the long established stage carriage services. The Stanhope-Crook and Bishop Auckland-Stanhope services were linked by omitting the section of route between Fir Tree and Howden-le-Wear thus enabling an hourly frequency to be maintained more economically by just two buses. All services were registered to operate commercially Monday-Saturday daytimes only with evening and Sunday services being operated on tendered contracts from Durham County Council. Rural Ride minibus services also appeared in the late 1980s. Maurice Gibson tragically died in 1982 soon after his daughter Allyson had entered the family business. Her brother Anthony and cousin Ian followed her into the business later in the decade. In the 21st century school contract work became increasingly important and many secondhand double deckers entered the fleet; at its peak some twenty vehicles were required for this work and to eliminate much dead mileage a new depot was opened at Crook. Further County Council contracts were secured for the Crook town service and the Blanchland Rural Ride. Private hire and excursions have always been an important side of the business and the first Continental tour was operated in 1989. Weardale coaches also have operated on hire to Urquhart Travel and in providing rail replacement services on the East Coast Main Line. Over the years the coach fleet has consisted predominantly of Leylands and Bedfords; the last Bedford YLQ and Leyland Leopard were purchased in 1977/9 respectively. Volvos entered the fleet from 1989 often sporting the cherished registrations WMS or GIB. The first new Bova appeared in 1996. Usually there are about ten frontline coaches in the fleet which latterly has included Neoplan Euroliners, Irisbus Euroriders and a Mercedes-Benz Vario.